So happy to be back on the juice wagon again – I’ve missed my daily green fix. Since our return from the US, however, our jet lag has left us all in a bit of a daze so radical measures were needed. 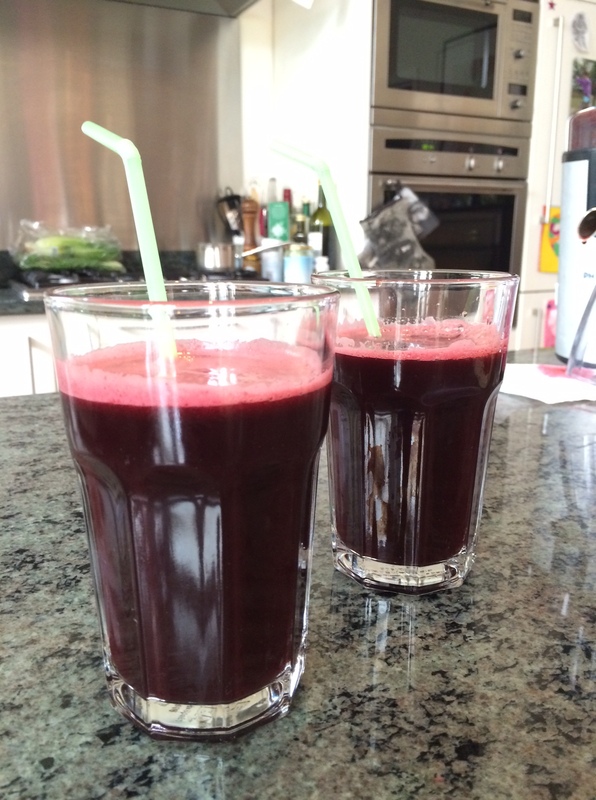 Today’s juice turned out not to be green at all but a delicious shade of beetroot red due to, you guessed it, beetroot. The colour is actually so amazingly intense that I had to take care not to get juice splashed on my light coloured clothing – it certainly stains. Why beetroot? Well, it has long been prized for its medicinal qualities and is often used as a part of a detox programmes, being an impressive detoxifier and blood purifier. The humble beetroot packs quite a powerful punch. It can be used in all kinds of culinary ways too, such as grated raw in salads and juices, cooked, souped, pickled or roasted. In Natural Wonderfods beetroot is said to aid cell cleansing by increasing the liver’s production of detoxifying enzymes, and the beta cyanin that makes beetroot red has antiviral and antioxidant properties. It also contains silica, vital for healthy skin, hair, nails, tendons and bones.